A few months back, I had the opportunity to sit down with Bill Hurley, the founder and general manager of brewery-in-the-making Empirical Brewery. I thought his ideas were ambitious but meticulously thought-out and I was fascinated with his approach to forming a brewery. Specifically, he had incorporated the “science” theme into every facet of the brewery, including brewing multiple batches of the same beer but changing one variable each time to achieve the best end result. In the weeks and months that followed after my post was published, however, I had not heard anything about this brewery; there were no updates on Twitter or Facebook, no newsletters, no website updates. Were they still planning on opening? Did they fold even before they started? Well, not only are they still planning on opening but both Bill Hurley and brewer Jim Cozzens have been exceptionally busy working on turning Empirical into a Chicago brewing institution. So when I received an invite to attend an exclusive tasting, I immediately RSVP’d yes. The tasting was held in a suburb approximately 20 minutes (sans traffic) from downtown Chicago at Burke’s Beverage, a family-owned business that is interested in distributing Empirical once they are up-and-running. Hurley had arranged for a bus to take us city dwellers from the corner of Monroe and Wabash in the Loop to the tasting. This was an exceptionally nice touch and definitely contributed to relieve my nervousness about driving to a suburb I had never heard of before. 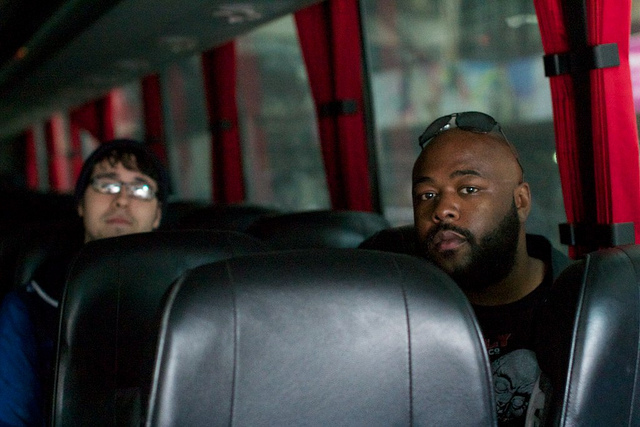 The best part was that it was a huge coach/charter bus and only five of us needed a bus ride. I almost demanded that I have 10 rows exclusively for myself but it got a little awkward sitting in the back of the bus alone so I decided to join everyone else up front. Who let these guys on here? Chicago Beer Geeks Armando and Nik accompanied me on the massive bus to Burke's Beverage. We arrived at Burke’s in record time and were greeted by a young woman (I found out later it was Bill Hurley’s wife) in an Empirical Brewery polo shirt. We were escorted into a large room that resembled the corporate meeting room in a suburban Marriott. There was a large wooden podium with two projection screens on either side, both emblazoned with the Empirical logo. On the one side there was a pretty sweet bar with a large German stein collection and three beer taps. I guess the beers were pouring a little foamy because they were being transferred into carafes prior to being poured into the tasting glasses. The hubby and I giddily went up to the bar to have our very first taste of Empirical Brewery beer. The bar had a few scientific toys scattered around, as well as a Periodic Table of the Elements poster on the wall. That was a nice touch; it is fun how they have embraced the scientific theme and are incorporating science into every part of the brewery operation. There were three beers initially available: an IPA, a Kolsch, and a Stout. As any self-described hop head would, I started with the Prime Vertical IPA. I was a bit underwhelmed with this beer; it had a nice flavor but was not overly bitter and it was hazy in appearance. I overheard Cozzens telling Paul Schneider from Chitown On Tap that he was not particularly happy with it this time around so maybe it was just this particular batch. I am more than happy to taste-taste the IPA again in the future! You know, in the name of science. The other beers were quite tasty. The Photon Kolsch was bright, crisp, and refreshing, and the Event Horizon Stout was rich, chocolaty, with a nice lingering coffee bitterness. After the mingling and beer-tasting session, we were asked to take our seats for Hurley’s presentation. It was explained to us that there would be an experiment involving their American Pale Ale. This experiment took the same recipe but changed one variable in each batch and it was our civic duty to choose our favorite variations. 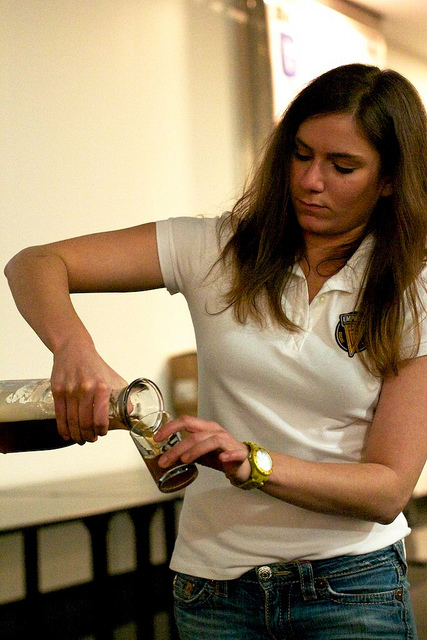 For example, one lot was brewed with regular Chicago tap water while another had Burton Salts added in order to adjust the PH of the water to resemble traditional British water. I personally preferred the Burton Salts as it seemed to brighten the hop character and allowed more bitterness to come through. 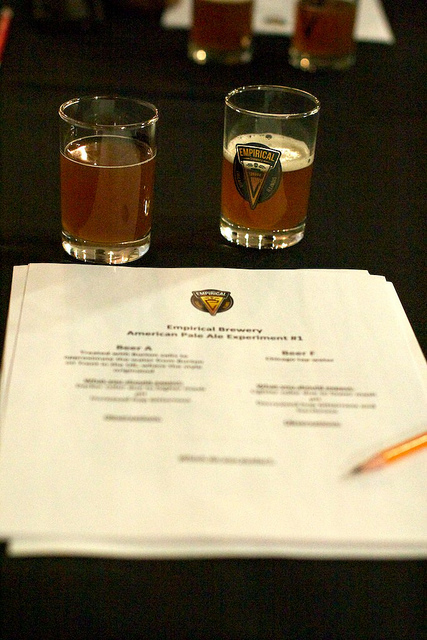 There were three pairs of beers that we tasted and noted observations on the score sheet. I felt that this experimental component needed more explaining. I didn’t initially realize that the two taster glasses on the table were different; each had different takes on the empirical logo on them but one was colored in and one was a black outline. Bill kept referring to the “colored glass” but I didn’t immediately understand what he meant. Had I had a little too much beer at the pre-tasting? Probably. But I wasn’t the only one who was confused. Also, some of the beers got mixed up so I am not sure if I was drinking the beer that was supposed to be rated. Servers didn’t know which beer was what, and sometimes told me it was one beer and it turned out to be another. Of course, there are going to be hiccups in every event. What I should be concentrating on is that no matter what variation of this American Pale Ale is chosen, they are all delicious. Intense passion fruit flavor and aroma, I could knock back a few in an afternoon. During the experiment, Hurley discussed brewing history, Chicago brewing history, and the future of beer in Chicago. The training and development geek in me was really digging the power point slides (I was a T&D Consultant in a former life). 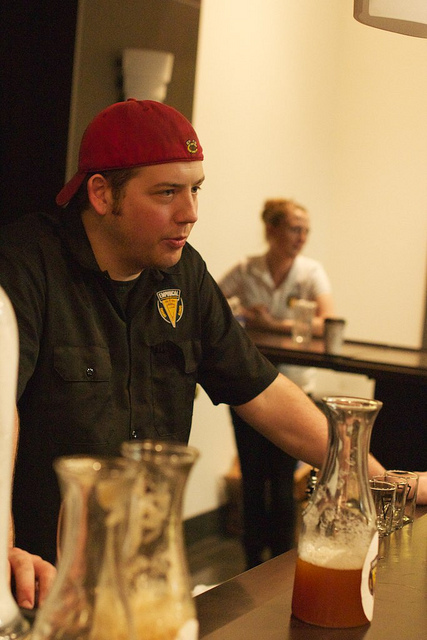 Bill is a financial analyst by day and you could see his analytical mind at work in both the way he presented information and in his approach to the brewery. He went into why craft beer is big now, mentioning how it is an affordable luxury people are able to enjoy during a recession. 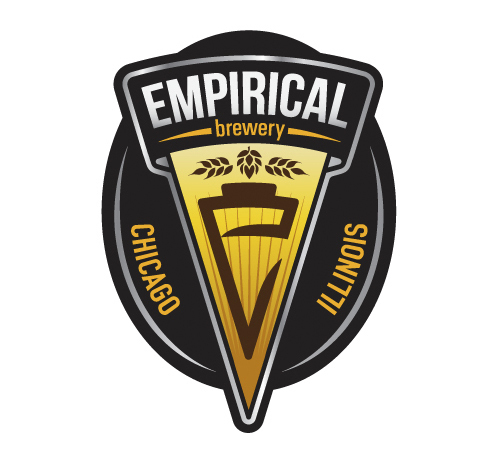 Hurley stated that Empirical Brewery will start with a 30 barrel system, which is quite ambitious for a new brewery and not the route that other new Chicago nano-focused breweries are taking. In addition to this brew house, there will also be a smaller one-barrel system in the taproom for experimental brews; he wants there to always be something new on tap. Also, he will have guest brews on draft in the taproom featuring other Chicago area breweries. Then he wants to duplicate the brewery abroad. According to Hurley, the definition of a craft brewery only refers to domestic capacity; you can have a foreign brewery and produce beer in another country without it impeding on your allotment here in the U.S. He is already looking at China and other nations as possible homes for a future brewery. Quite the ambitious notion considering they don’t even have a lease signed on a space here in Chicago yet! The scientific theme is used in the names of their beers as well as their series of beers. The 2∏r Series uses the equation for the circumference of a circle to inform customers that it is a year-round offering. So cute. There is also a series of lower-calorie, full of flavor varieties such as the previously mentioned Photon Kolsch (so named because a photon is a hybrid particle and a Kolsch is a hybrid beer. Love it!). While the Kolsch was quite tasty we were able to sample a Hefeweizen that was also part of this line that was not to my liking. While the aroma was full of banana bread, the flavor was watered down and the mouthfeel was thin. I’m still on the fence about how I feel about have a craft brewery having a “light” series of beers. If I’m watching my calorie intake, I would rather limit myself to one beer or have a smaller glass of a full flavored beer than a tall glass of watery, unsatisfying beer. 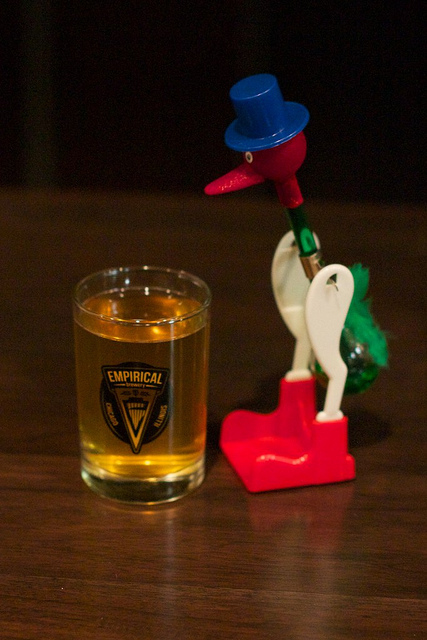 I am so glad that I was finally able to sample some of Empirical Brewery’s tasty beers. If you want to learn more about the goings-on at Empirical, check out the blog on their website. 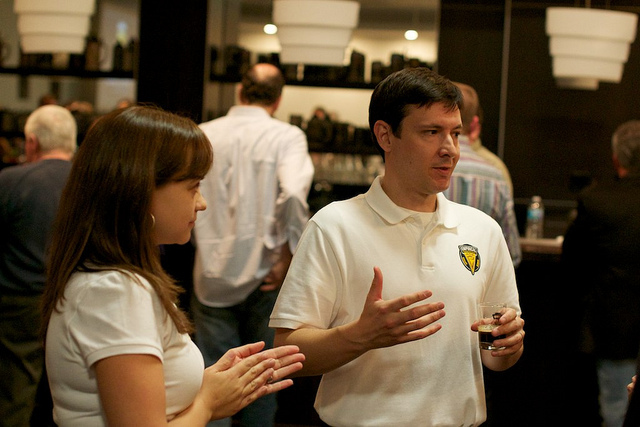 For more pictures of this tasting event, be sure to check out Christopher Murphy’s flickr page.